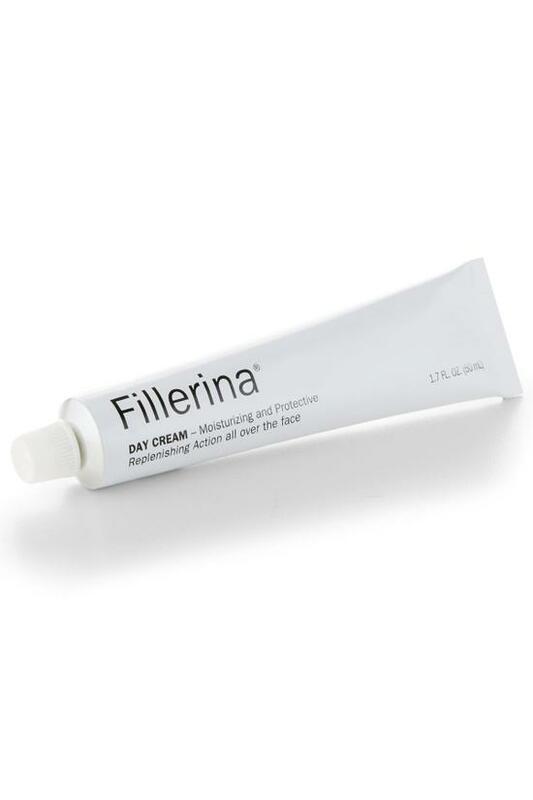 Intensely hydrating Day Cream complements and prolongs the plump, smooth and youthful benefits of your at-home Fillerina® Replenishing Treatment 07970 (up to four months). · Luxe, daily moisturizer features a patented blend of six different sizes of Hyaluronic Acid molecules that travel to different layers of the skin to fill lines and wrinkles and replenish lost Hyaluronic Acid (what gives skin its plumpness). · Day Cream and Fillerina® Night Cream (07972) are great solo anti-agers, but deliver even more powerful Hyaluronic Acid building and plumping when used following the completion of the more-intensive Fillerina® Replenishing Treatment (07970) 2-week regimen. Aqua, Cetearyl Isononanoate, Propylene Glycol, Ethylhexyl Methoxycinnamate, Ethylhexyl Salicylate, Glyceryl Stearate SE, Glyceryl Stearate, Ethylhexyl Cocoate, Ceteareth-20, Isodecyl Oleate, HDI/Trimethylol Hexyllactone Crosspolymer, Methylene Bis-Benzotriazolyl Tetramethylbutylphenol (nano), Cetyl Alcohol, Aluminium Starch Octenyl Succinate, Imidazolidinyl Urea, Xylitol, Cocos Nucifera Oil, Ethylhexylglycerin, Phenoxyethanol, Parfum, Glycerin, Sodium Hyaluronate, Carbomer, Tocopheryl Acetate, Hydrolyzed Glycosaminoglycans, Methylparaben, Ethylparaben, Glyceryl Oleate, Limonene, Silica, Butylparaben, Propylparaben, Cyathea Cumingii Leaf Extract, Linalool, Butylene Glycol, Pseudoalteromonas Ferment Extract, Sodium Hyaluronate Crosspolymer, BHT, Hexylene Glycol, Hexyl Cinnamal, BHA, Hydrolyzed Hyaluronic Acid, Butylphenyl Methylpropional, Geraniol, Citronellol, Hyaluronic Acid, Coumarin, Hydroxypropyl Cyclodextrin, Hydrolyzed Sodium Hyaluronate, Citral, Pentylene Glycol, Caprylyl Glycol, Arginine, Salicylic Acid, Sodium Hydroxide, Citric Acid, Ascorbyl Palmitate, Acetyl Hexapeptide-30, Palmitoyl Tripeptide-38, Acetyl Hexapeptide-37.6 Hyaluronic Molecules, Xylitol, Matrifull, Vitamin E, Hexapeptides, Salicylic Acid, Sunscreen, Coconut Oil.